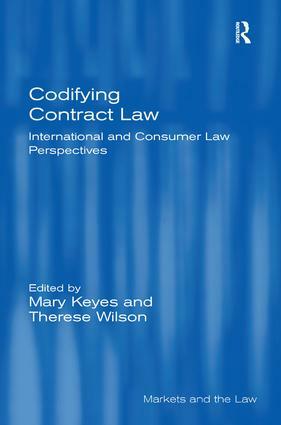 Exploring the advantages and disadvantages of codifying contract law, this book considers the question from the perspectives of both civil and common law systems, referring in detail to issues of international and consumer law. With contributions from leading international scholars, the chapters present a range of opinions on the virtues of codification, encouraging further debate on this topic. The book commences with a discussion on the internationalization imperative for codification of contract law. It then turns to regional issues, exploring first codification attempts in the European Union and Japan, and then issues relevant to codification in the common law jurisdictions of Australia, New Zealand and the United States. The collection concludes with two chapters which consider the need to draw upon both private and comparative international law perspectives to inform any codification reforms. This book will be of interest to international and comparative contract law academics, as well as regulators and policy-makers. Mary Keyes is a professor at Griffith Law School, where she teaches and researches principally in the area of private international law. She is widely published in this area, including a leading Australian textbook. She is a member of the Expert Group advising the Australian Standing Council on Law and Justice on reform of private international law. Therese Wilson is a Senior Lecturer in Law and Deputy Head of School Learning and Teaching at Griffith Law School, and teaches and publishes in corporate law, banking and finance law and international commercial arbitration, as well as publishing on the UN Convention on Contracts for the International Sale of Goods and on consumer law, particularly with regard to consumer credit issues. She has been a participant in the UNCITRAL expert group meeting on contract law reform in East Asia and the Pacific. Markets and the Law is concerned with the way the law interacts with the market through regulation, self-regulation and the impact of private law regimes. It looks at the impact of regional and international organizations (eg EC and WTO) and many of the works adopt a comparative approach and/or appeal to an international audience. Examples of subjects covered include trade laws, intellectual property, sales law, insurance, consumer law, banking, financial markets, labour law, environmental law and social regulation affecting the market as well as competition law. The series includes texts covering a broad area, monographs on focused issues, and collections of essays dealing with particular themes.